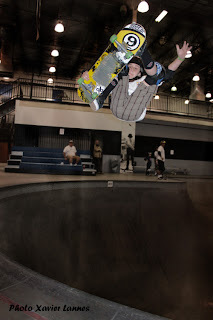 This year's Vans Amateur Combi Pool Party is set to take place January 27th and 28th, 2012 at the Vans Skate Park in Orange, California. The festivities will kick off on Friday with a 5:30 p.m. registration followed by a 6 p.m. practice session. What makes the Combi Pool so exceptional is that it some kind of copycat of the old Upland Pipeline Skatepark that was destroyed about two decades ago. The 9 foot plus transitions only adds to its gnarliness. The Orange Mall skatepark is also the only remaining Vans Skatepark in existence. The company had facilities in Houston and Orlando, Florida. Houston was closed several years ago and Vans has to shut down Orlando skatepark in early 2012. Just in case you have never been there before, the Vans Skatepark in Orlando was a massive homage to skateboarding. It featured a 25,000 square foot indoor street course, a 15,000 square foot outdoor course, an 8,000 square foot warm-up course, a concrete bowl, ramps and an arcade. It was forced to close due to property re-development and non-renewal of the company's lease. On Saturday 28th, the contest will start at 9:00 a.m. with a round of practice sessions before the first qualifying round takes place. The heats are slated to begin at noon. Things will finish with an evening awards ceremony. Up for grabs is a $5,000 prize purse. This year some of the hottest kids in skateboarding have been invited to participate: Archer Braun, Morgan Wolf, Cory Juneau, Evan Doherty, Alex Sorgente, Heimana Reynolds and Austin Poynter are just a few of them. Archer Braun was born on June 18, 1997 at Ann Arbor, Michigan but moved to South Pasadena, California some time ago. He worked at Vans Skatepark and likes to skate, play golf, soccer, lacrosse, DJ, and "play video games with my brother". Read Archer Braun Interview on isTia.Tv. Heimana Reynolds is another talented up and comer. He has been skating since he was a toddler. Skate fans may recognize him from his X-Games, King of the Groms or Disney XD's Next X appearances. His sponsors include Dakine, LRG and DC Shoes. Read Heimana Reynolds Interview. Alex Sorgente is a little ripper who is as talented a skater as he is a motocross rider. In 2011, he was ranked as one of the 25 Best Bowl Riders and was named the Top Amateur Skater at the Pro-Tec Pool Party that same year. He is also a member of the Grind for Life Skate Team and enjoys sponsorship support from such heavy hitters as Blind and Globe. Read Alex Sorgente interview with isTia.Tv. Austin Poynter is a skillful 16 year old who has sponsorship support from Oakley, Powell Peralta, Osiris Shoes, just to name a few. He is known to unleash a sweet fs viral and huge airs, he is known to visit the Carmel Valley Skatepark in San Diego, California. Poynter is also no stranger to the Combi Pool Party event. He was top qualifier and won his division in 2011. Read the two Austin Poynter interviews with isTia.Tv.